22 Years ago today, NSGA Keflavik Closed. NSGA Keflavik was decommissioned and closed on June 30, 1994, 22 years ago today. 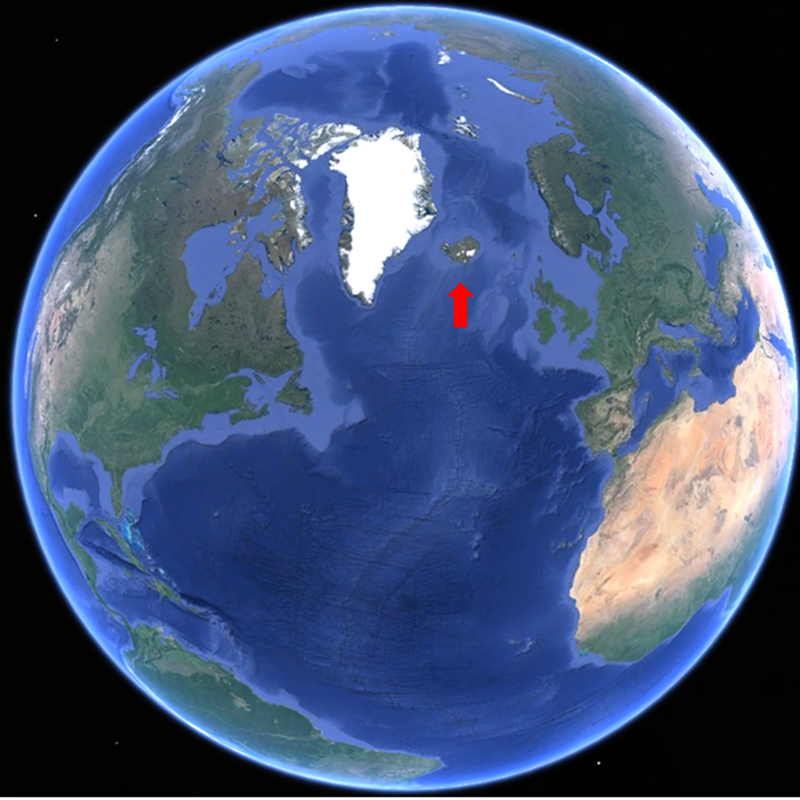 The NSGA was located approximately 8 miles from NAS Keflavik, one mile from the U.S. Air Force 932nd Air Defense Squadron facility, and adjacent to the Naval Computer and Telecommunications Station Keflavik, Rockville Receiver Site. The Rockville Receiver Site was fully remoted on March 14, 1997 and was closed in October, 1999. In March of 1959, an advance party arrived at Hafnir, Iceland to prepare for the establishment of United States Naval Security Group Activity (NSGA), Keflavik. The advance part team was led by the assistant Officer-in-Charge, CWO2 Earl W. Stewart, and consisted of CTAC Bill Tait, CTMC Nellie Nelson, CTM1 Helphrey, one CTM2, two CTM3s and one “logistics” seaman. 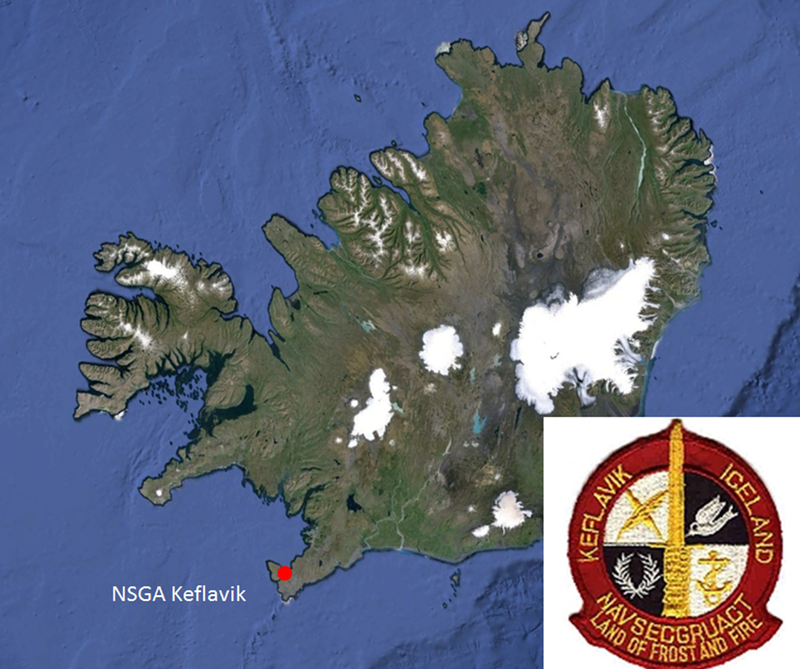 The following month on April 25, 1959, the NSGA Keflavik was formally established in the village of Hafnir, approximately five miles from the main base at Keflavik International Airport. At that time, the U.S. Air Force was the host of the North Atlantic Treaty Organization (NATO) Base and the Naval Air Facility was charged with providing administrative and logistic support to the command. 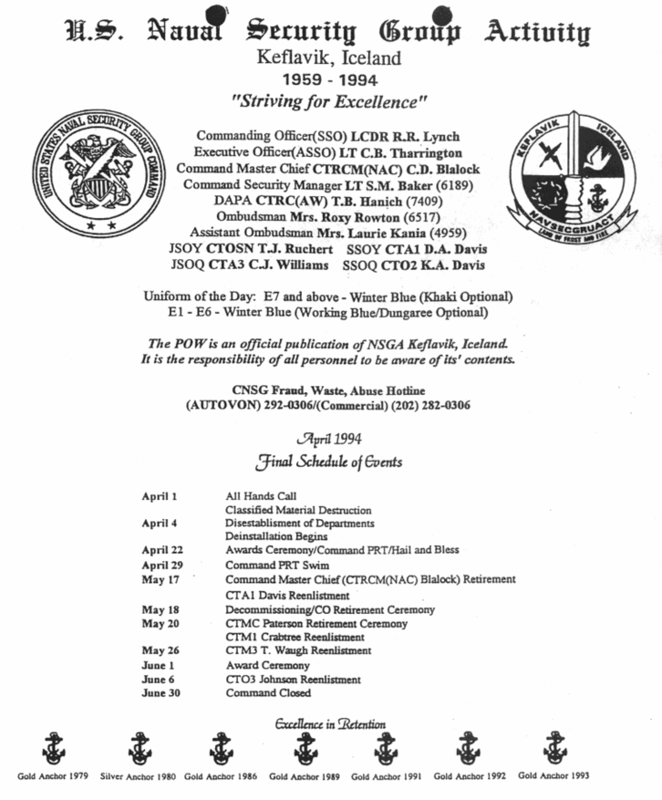 In May, 1959 the NSGA officially joined the Atlantic High Frequency Direction Finding (HFDF) net, earning the dubious distinction of being the norther most Naval Security Group site in the world. The tour length for all personnel was one year, which compensated for the remoteness of the duty assignment. 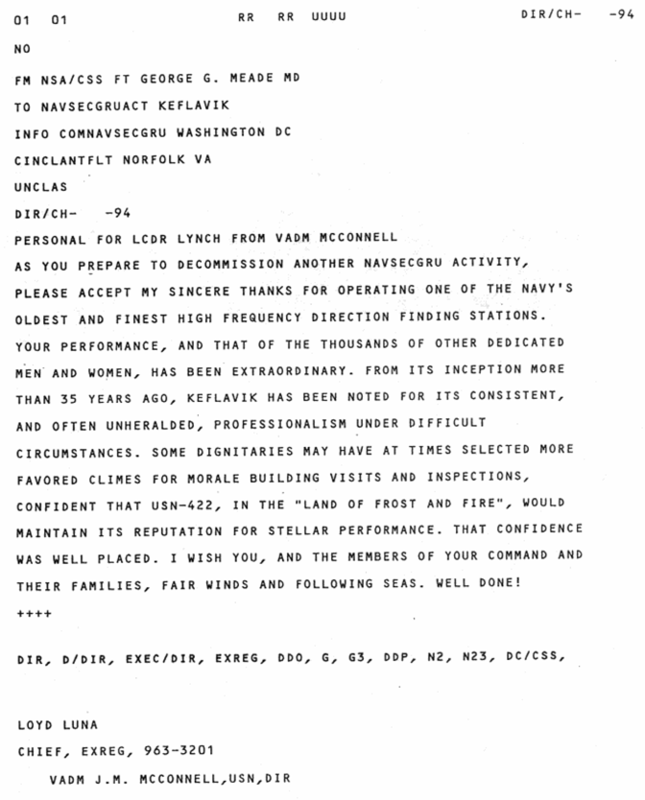 In November 1967, the command assumed an additional function as a CRITIC Communications (CRITICOM) relay station and personnel tasked with this work were assigned to Hanger 831 aboard Naval Air Station. By this time the Navy had assumed host responsibility for the air station and the position of the senior officer at the NSGA was upgraded from Officer in Charge to Commanding Officer. In April, 1970, a special operations building was completed at Rockville, which was home to the 932nd Air Control Squadron. In 1973, talks began on the feasibility of consolidating the three separate sites that made up the NSGA into one central location. On June 7, 1977, ground was broken for a new consolidated operations building, which was completed and occupied on August 1, 1979. By the summer of 1979, all of the operational, administrative, communications and facilities functions were consolidated in building 2586 on the Rockville site. Since its establishment, the amount of personnel stationed at the NSGA has fluctuated. The original complement was 30, which rose within one year to 59. At times the command was manned by more than 150 personnel. In 1994 it was announced that due to technological advances and military drawdowns, NSGA Keflavik would cease operation in March and officially close as a command on June 30 of the same year. The Commanding Officer will be the last command member to depart on 24 July 1994. NSGA Keflavik has served the United States and the NATO for over 35 years.